The Department of Neurology has 60 full time faculty members and medical students, residents and fellows recruited from the top medical schools. The Department of Neurology operates in a teaching hospital environment and is one of the largest Neurology Departments in the world. The Department is able to provide patients with state-of-the-art therapies, in part because of its participation in research studies and scientific meetings. received the prestigious Javits Award from the N.I.H. 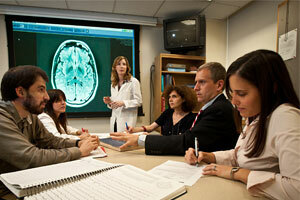 Details for the residency program can be found at our Neurology website at the Albert Einstein College of Medicine.